Why does it matter that today is the Monday before the Eclipse? I’m a big Moon fan. We’re going to have a combination of a Full Moon, an Eclipse AND the Winter Solstice. I should have been a Druid! Although most of my shopping is done ( just a few more gift cards to purchase) I still have no Christmas spirit. I don’t know why (well I do, but that’s a tale for another day.) So maybe being a Druid is the answer. So when do I get to visit Stonehenge?!? Anyway, when Gail and Alice suggested we go to Wegman’s in Cherry Hill, I was up for it to help take my mind off of things. I truly wish I could go there and spend the entire afternoon browsing their shelves. They have such a wonderful collection of unusual foods. Alice and I decided we would do that after the Holidays. We’re also planning a trip to Trader Joe’s. I wish these stores would be an option when we get to New Mexico but that doesn’t seem to be possible. The closest Trader Joe’s is near Tucson, about 2 hours away. But Silver City has a wonderful co-op which I can’t wait to visit on a regular basis. It also has a wonderful Farmer’s Market that runs from May 1 through October 31. We had the chance to visit both during our visit in October and it was wonderful! So today at Wegman’s, I took a little advantage of their interesting selections. 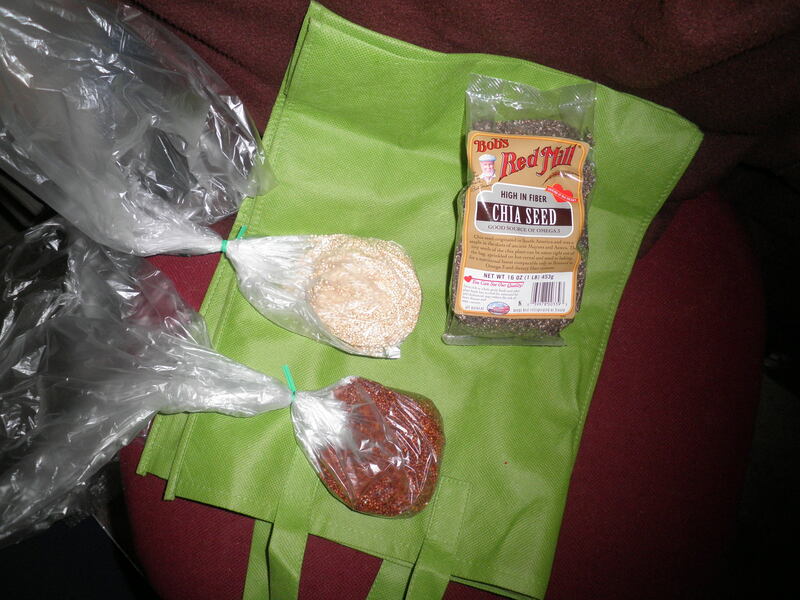 I got some regular quinoa, some red quinoa and some chia seeds. I hear and read so much about the benefits of the chia seed that I thought I’d give them a try. As you can see from this photo, I’m still trying to find ways to take photos with my current limited space situation. Then of course after putting away the groceries and making my oatmeal, I forgot to put the chia seeds in! I even forgot my usual flax seeds. 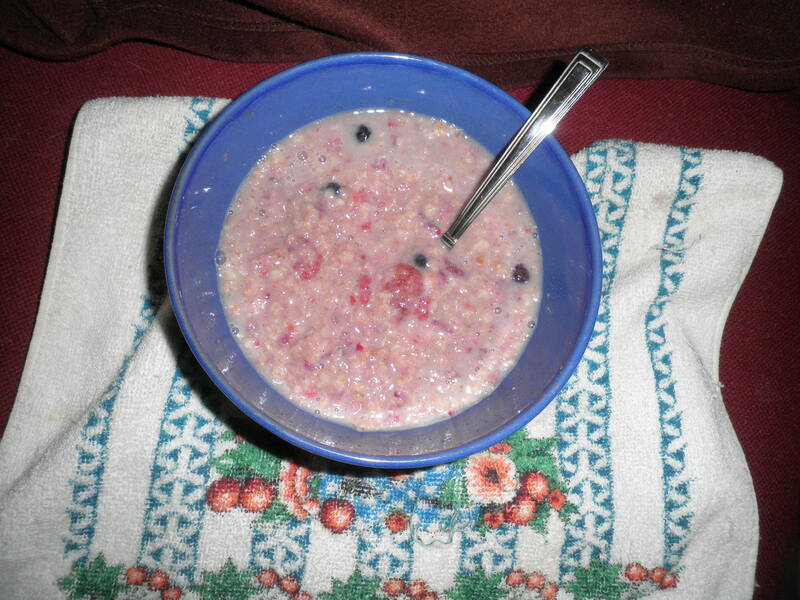 Ah well, with some cinnamon, some frozen berries and some honey…it was still good! I don’t usually use honey, I usually use Splenda. I liked it with the honey, but I need to use a little more the next time. Gee, my computer chair works pretty well for staging food. I need to get a little more creative with my backdrops but I like this. It’s been bothering me and I’m glad to have come up with a solution that works for the moment. I can’t wait until I have the chance to do more real cooking and share some of my favorite ideas for vegetarian meals. I actually just want to EAT them! That time will come, but in the meantime, I will move along with learning this whole process. The next few days will be challenging in many ways, with handling food being at the top of the list. Wait until Friday…that’s going to be fun! Basically, a food free for all! So now I have to think about taking a nap…the Eclipse is at 2:41am…wonder if I can get a photo…stay tuned! I still can’t believe that the person ( me ) who never sleeps through the night is the only one who missed the eclipse! Good Grief!!!! Most nights I’m awake all night but nooooo not the night of the eclipse! I slept through the whole thing! Bummer! I did have the foresight to put all of my crystals in the front window to bask in the moon light. Hahaha, I love your effort on finding places to photograph! So funny. And yay for the chia seeds! Just a suggestion for using them in your oatmeal – I always add more liquid. I love my oats really thick, but the chias absorb something like 8 times their volume. If I make up a mug of overnight oats, I just add water in the morning if I need it, so I don’t ruin it.